At a recent information evening held in the Horseleap Streamstown Community Centre, Basil Mannion, Community Water Officer, addressed Streamstown Tidy Village committee and the members of the local community, highlighting the importance of the work they do in raising awareness of environmental issues in their area. Mr. Mannion advised on the necessity of protecting the rivers and streams in the area as they lead into the Gageborough river and drinking water is extracted from this river further downstream. He complimented the St Joseph’s Foróige Group for their excellent project on investigating alternatives to chemical weed killers and invited the group to give their presentation. The nine members representing the Foróige Club gave a short presentation outlining the actions undertaken by their group. They also had information boards on display and samples of the weed killer sprays. Following their presentation, Mr. Mannion presented each member of the club with their Eco Unesco certificates. The Group were Junior Water Winners and Overall Junior Award Winners in the Eco Unesco Young Environmentalist Awards. 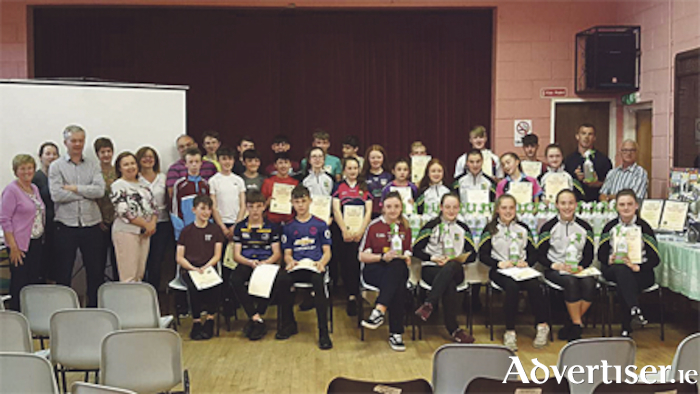 Mr. Mannion stated, “the work carried out by the Foróige Cub is very important as the Gageborough River is listed as an area for “action” under the River Basin Management Plan and having a vibrant group like this Foróige Club who are active in protecting their water is vital to the success of the National Plan”. He continued, “it is very encouraging to see this type of project being done by a youth group in their own locality and I encourage more individuals, groups and communities to come together and get involved also”. Mr. Mannion advised that only the three “Ps” should ever go down the toilet - pee, poo and paper and that baby wipes are ‘virtually indestructible’, causing a lot of problems despite their innocent appeal. Concluding his presentation, Mr. Mannion noted, “it’s people who save and protect our waters, not plans” and he reiterated his invite for people to get involved in taking action. Mr. Noel McCormack, Streamstown Tidy Village, thanked Mr. Mannion for his presentation and reiterated the importance of the work carried out by the Foróige Club. He complemented the group on their enthusiasm for the project and for getting involved with the Tidy Village Committee. He thanked Ruth Maxwell, Environment Dept, Westmeath County Council, for her guidance and support on the project. He also thanked the Local Area Prevention Network for funding for the ingredients, bottles and labels. He concluded the evening by offering a free sample of the weed killer, prepared by the Foroige Club, to every member of the audience. The Local Area Prevention Network (LAPN ) is a co-operative project between the EPA led National Waste Prevention Programme and Local Authorities in Ireland. LAPN aims to build capacity in local authorities for promoting waste prevention at a local and grassroots level for the benefit of their region.